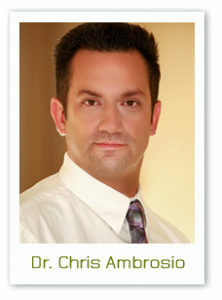 For over 20 years, Dr. Christopher Ambrosio has been bringing results to his patients and the Woodstock community. No matter what your condition may be, we are here to help in any capacity to enable you to become the healthiest person you can be, naturally and holistically. Dr. Ambrosio’s experience in a variety of medical clinics has shown him the importance of a holistic approach to patient care. No matter what your age or condition, we look at the whole person. There are three main areas or as we call them bases that affect your health. These areas are: Structural (spinal misalignments), Emotional (Stress), and Bio-chemical (Nutrition and diet). If we can determine what is affecting these 3 areas and fix these issues, then we are addressing all bases of health so you can achieve optimal health. When you meet with Dr. Ambrosio he will go over these areas with you in order to create the best holistic care plan to get you well and keep you well. We are proud to provide a state-of-the-art, comfortable facility. We are confident that you will feel at home and we welcome you to be a part of the Abundant Health & Wellness Center, Inc. family. We offer the finest quality of care through the use of modern chiropractic equipment and technology to help you achieve your health goals. At Abundant Health & Wellness Center, Inc. we use a modality you won’t find anywhere else to help take care of you and improve your life. The Magnesphere™ system is a whole-body immersion system that utilizes precise, extremely low levels of electromagnetic fields to enhance feelings of relaxation, and relieve pain. It involves no drugs, surgery, or pain. We have seen incredible results with this technology in just one session. In addition, we use our ASA Balance, a computerized health assessment and cold laser machine that scans your body on eight different levels to check for imbalances, nutritional deficiencies and to help eliminate allergies. Learn more about what we have to offer! Give us a call today to see how our many options for health care can suit your needs!